The rumors were true. Many Bowie researchers had concluded that “Shilling the Rubes,” long considered to be a lost Bowie classic, was only just a working title for Young Americans, a name that bootleggers occasionally slapped upon another outtake. Then in 2009, a reel from Bowie’s Sigma sessions supposedly turned up in a Philadelphia street fair (it’s speculated that the tape went astray (cough) from the rest of the Sigma reels, which are housed in the Drexel University Audio Archive) and it subsequently sold on eBay for $15,000. Only about a minute’s worth of each track circulated, apparently as a sampler for prospective buyers on eBay. So all we have of “Rubes” are an eight-bar intro in which Mike Garson’s piano faces off against Andy Newmark’s drums, and the first verse, which is an intriguing bit of sleaze by Bowie, suggesting that “Rubes” was revisiting the love-as-prostitution theme of “Sweet Thing.” The fragment cuts off before the chorus (if there was one), thus retaining “Rubes”‘ status as the great unheard Bowie song. One imagines the whole four-minute track will turn up someday (though there’s already been a gold-plated reissue of Young Americans), but until then “Shilling The Rubes” will remain largely imaginary. This entry was posted on Thursday, October 7th, 2010 at 10:01 am and is filed under Middle RCA Years: 1973-1976. You can follow any responses to this entry through the RSS 2.0 feed. Both comments and pings are currently closed. The song sounds great, so, be warned, it’s a frustrating listen, which is possibly why you didn’t include a link. Thanks again for the interesting info. David, many, many thanks for that link. And how can it be that I’m the first to respond? I’m delighted to report that both files were still there a few moments ago, patiently awaiting my discovery, and that both are now snug and secure on my hard drive. 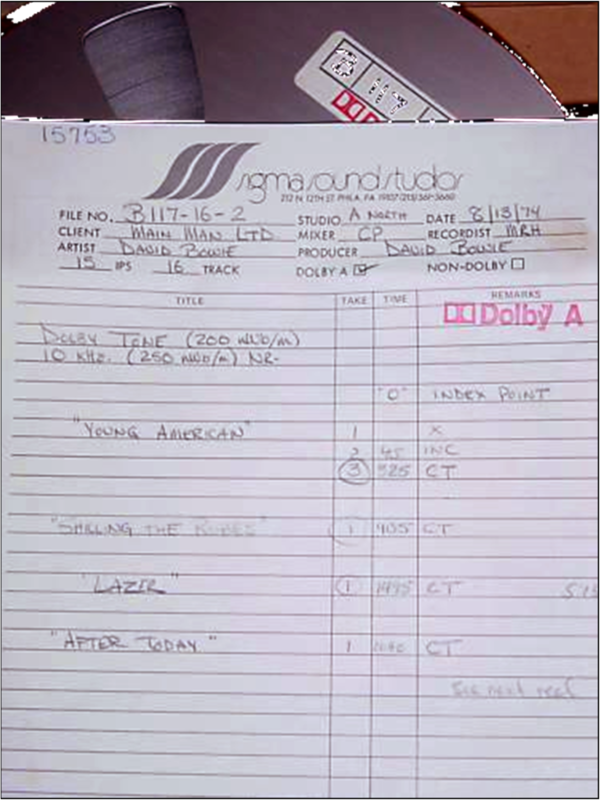 You wise ones who follow, take note that the “I Am A Laser” fragment is quite a different animal from those on Vampires of Human Flesh and whatever that other collection of Scary Monsters session work is called. Christ, what I am getting out of this blog! I’m not Chris, but… wait! Perhaps I am! Who can I be now? Funny – I’ve seen British texts refer to “shilling the rubes” as an Americanism. I believe it’s actually carnie lingo. Fan edit of the track, which builds on a further extract (possibly the entire track?) that leaked a month or two ago. From the archives of a Philadelphia university perhaps? Can’t really see why this isn’t a part of the Who can I be now? Recall set, but then neither is After Today so what can you say really? not the entire track–it’s looped after the refrain (which leaked a while ago). there’s another verse. the reasons why it’s not on the set are obvious–it’s a rough early-take recording with the occasional duff note on Bowie and the musicians’ parts. DB never released anything that “half finished” officially. was there a more completed version recorded? that’s the real question. Let’s hope it exists. Surely shades of ‘Dodo’ in the intro? I was hoping that more extras on a par with after today might appear on the box set but the unreleased and rare material is largely underwhelming really. I love this, it reminds me of candidate a little, I would love it if a more polished version surfaced but the listing for who can I be now suggests a move away from including even previously released rarities. The recall set doesn’t even have after today.